NEW YORK -- Gov. Andrew Cuomo says New York will honor the 49 people killed in a shooting at a gay bar in Florida with a monument. 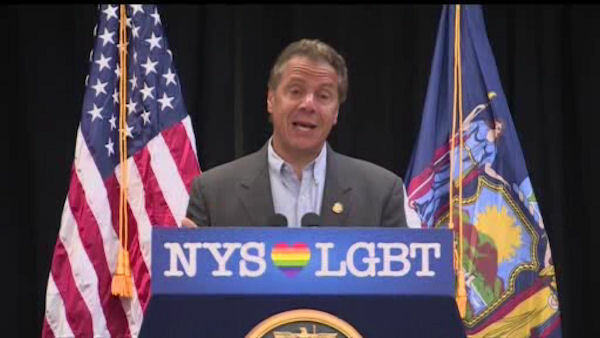 Cuomo announced the LGBT Memorial Commission on Sunday, before the start of the annual gay pride parade down Fifth Avenue in Manhattan. The 10-member commission will come up with recommendations on the design of the memorial and the specific location by year's end. Cuomo says the memorial will honor all victims of hate and intolerance. He also announced that the site around the Stonewall Inn would be designated as a state historic site. On Friday, President Barack Obama designated it as the first national monument to gay rights. A 1969 police raid on the bar was a major catalyst of the gay rights movement.